A taxobox (short for taxonomy infobox) is a table found on Wikipedia articles setting out the currently largely-accepted scientific classification of an organism or group of organisms. Note that there is sometimes taxonomic debate on the status and name of a taxon. As of 2006, the English Wikipedia contained more than 16,000 taxoboxes. This article explains how to read a taxobox. Refer to the figure on the right, which shows the taxobox from the article Colorado potato beetle. The title of the box is a common English name for the organism, if any, or else the scientific name. A reference mark here indicates the source of the contents of the taxobox, unless otherwise noted. This is a line (or section) specifying the conservation status of the species — an indicator of the likelihood of that species continuing to survive. The Colorado potato beetle is "Secure": there is no known immediate threat to the survival of the species. For species under threat, Wikipedia follows the status given on the IUCN Red List of Threatened Species. A picture of a typical individual. The central section of the taxobox sets out the currently accepted scientific classification of the organism or group of organisms described by the article. This is the hierarchy of groups, called "taxa" (singular: taxon), to which the organism belongs. In cases where the taxonomy is uncertain, in dispute, or currently undergoing a revision, this section attempts to represent current, but conservative, scientific consensus, and does not usually attempt to follow the very latest research. On the left of the classification are the "ranks" of the taxa that are named on the right. A species is a population of related individuals that share a more or less distinctive form and are capable of interbreeding. It is included in a genus (a group of related species), which is included in a family (a group of related genera) and so on. Normally the seven "major ranks" appear as shown here, but in cases where more detail is appropriate, "minor ranks" may appear as well. For example, a subfamily may appear between family and genus. The binomial name or "binomen" is the currently accepted scientific name for a species. It consists of the name of the genus followed by a "specific epithet". 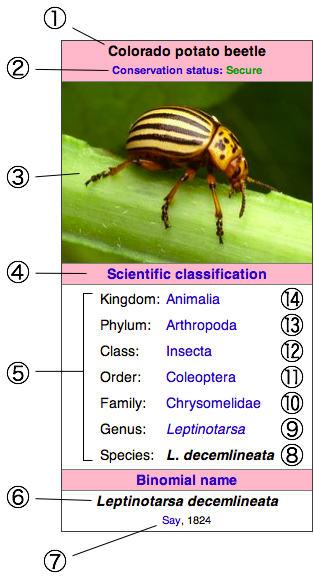 Binomial names must be chosen so that no two organisms have the same name; this means that scientists can use Leptinotarsa decemlineata to refer to the Colorado potato beetle without ambiguity. Binomial names are written in Latin, or other languages transliterated into Latin. (This has its origin in the science of the 18th century when the binomial system was popularized, when scientific publication was most often in Latin.) In the case of the Colorado potato beetle Leptinotarsa is Latinized Greek meaning "delicate feet"; decemlineata is Latin, meaning "ten-striped". It is common practice and very much advised to write scientific genus and species names in italics. The first character of the genus name is capitalized; the specific epithet is always in lower case, even if it commemorates a place or a person. Below the binomial name is the authority for that name — the first person to publish the name together with a description of the organism (or a reference to such a description). In this case the name Leptinotarsa decemlineata was first used by US naturalist Thomas Say (1787–1843) in the first volume of his American Entomology, or Descriptions of the Insects of North America, published in 1824. The lack of parentheses around the name is a convention meaning that the species remains in the genus to which it was first assigned (parentheses indicate that the species has been transferred to a different genus). The genus Leptinotarsa contains more than 30 species of beetle, the most well-known being the Colorado potato beetle and the False potato beetle Leptinotarsa juncta. Chrysomelidae is the family of leaf beetles. This family contains more than 35,000 described species of plant-eating beetles. Coleoptera is the order of beetles, containing more than 350,000 described species. Beetles have a pair of hard wing-cases (elytra) which cover their true wings. Insecta is the class of insects, containing more than 800,000 described species. Insects have three segments (a head, a thorax, and an abdomen) and six legs. Arthropoda is the phylum of arthropods, which have a segmented body, jointed legs and a hard exoskeleton. Animalia is the kingdom of animals, which are multicellular, generally capable of locomotion and responsive to their environment. The background color of the box also indicates the kingdom the organism belongs to, with an extra color used for viruses. The pink background shows that the Colorado potato beetle belongs to the Kingdom Animalia. The scientific classification of an organism is a scientific hypothesis. It may be confirmed or refuted by new evidence. A future new study might demonstrate that the Colorado potato beetle is not a single species, but a group of very closely related but separate species; perhaps a cryptic species complex. A taxonomist may look in detail at the species in the family Chrysomelidae and propose a new classification splitting that family into several smaller ones or merging it with several others. ↑ Note that this rule only applies to organisms of which the names are governed by the same code: the sets of rules maintained by taxonomists to ensure uniqueness of names. Although taxonomists are strongly advised not to copy names that are used in other 'realms', it is not forbidden to do so. Many genus names exist that are duplicated in the animal and plant kingdom. Prunella modularis (a bird) has the same genus name as Prunella vulgaris (a plant); Liparis (for a genus of fish and a genus of orchids) is another example. At present there are at least three codes that govern scientific names: the International Code of Botanical Nomenclature (ICBN) for plants and fungi, the International Code of Zoological Nomenclature (ICZN) for animals, and the International Code of Nomenclature of Bacteria (ICNB) for prokaryota, each of which has no rights outside its own realm (see Nomenclature codes). History of "Info:How to read a taxobox"
This page was last modified on 5 November 2008, at 04:49.